I love combining things. Like peanut butter and jelly, avocado and chocolate and volcanoes and waterfalls. Yes, it’s those unexpected ingredients that go so well together. That’s why I fell in love with the Bromo and Madakaripura one-day tour. I recommend it to all of my friends who visit Bromo and I think you will love it. The Bromo and Madakaripura one-day tour is a long day. If you want to watch sunrise over Bromo you will have to wake up very early. Most people normally stay at a hotel in Malang, which is about a 90-minute drive from Bromo. To get to Bromo for sunrise you have to set off at around 3:30am in the morning (don’t worry, you can go back to sleep in the car for a bit). Bromo is an extremely popular tourist destination and Penanjakan gets busy for sunrise. If you have the chance I’d advise visiting on weekdays when the crowds are smaller. I personally think it makes for a nicer experience. By the way, remember to bring along some warm clothes, as it gets very cold on the viewpoint. If it’s windy it can also get really cold. When those first rays of sunshine rise over the hills all those thoughts about the hassle of waking up early fall away. The view as the rays of sun stretch slowly over the valley floor is really special. It’s also a photographers dream, because the landscape around Bromo offers some of the best views in Indonesia. The other great thing about sunrise is that you instantly start to warm up. Believe me, you’ll appreciate it. 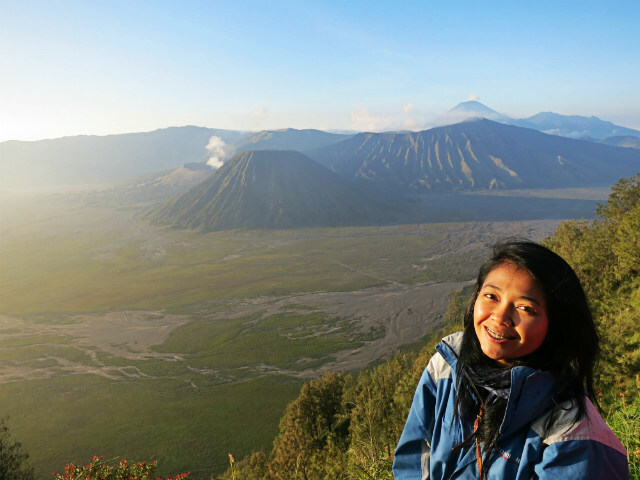 After you’ve watched the sun rise over Bromo it’s time to experience the volcano up close. It’s a 15-minute drive from Penanjakan to Bromo volcano. 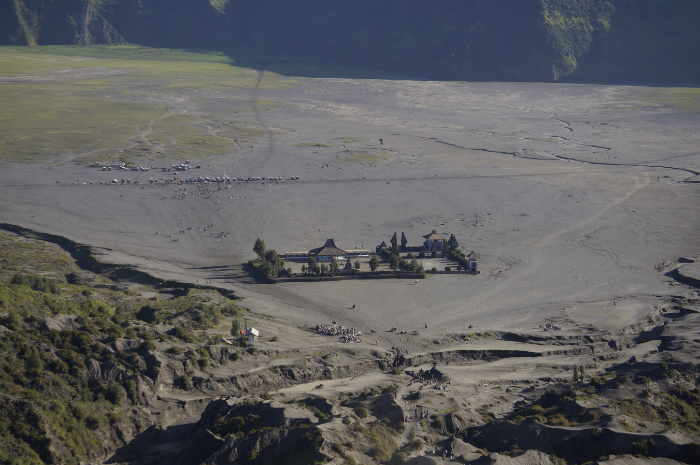 You’ll get dropped off on the dusty valley floor and will need to make the 10-minute walk along the valley to the base of Bromo. It’s nice to walk around and get some fresh air. 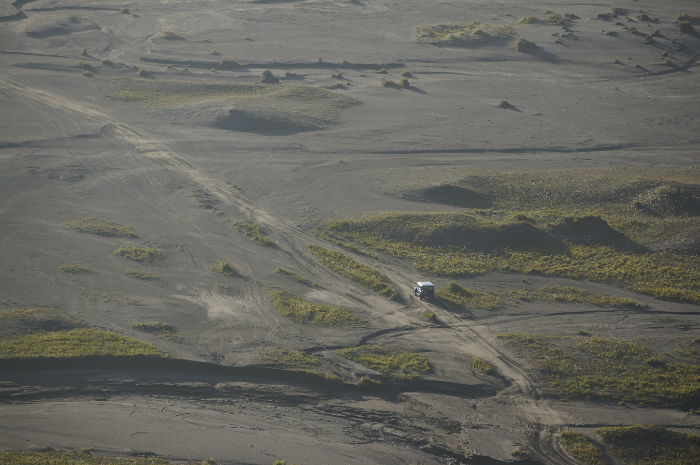 As you cross the valley you’ll notice that Bromo is a landscape of contrasts. There are the flat and dusty plateau that looks like a moonscape and green hills covered in thick grass and trees. Unlike most volcanoes in Indonesia, the climb to the rim of Bromo is actually very easy. It’s probably a 100-meter climb, if that. There are stairs cut into the side of the volcano, so you don’t have to worry about tripping over stones. Bromo volcano is active. From the top of the rim you can see Bromo smoking away beneath you. You can actually walk all the way around the rim of the volcano. You will find that most people gather close to the stairs though. There’s more to Bromo Tengger Semmeru National Park than Bromo. While you’re here I’d definitely recommend visiting the Tengger Sand Sea and the Savannah. They are well worth the visit and are a nice addition to the trip. If you want more information, you can read about my experience visiting Bromo here. By the time you’ve finished exploring Bromo the sun will be up and you will be hot and dusty. It’s the perfect time to cool off and visit Madakaripura waterfall for a nice swim (you did bring your swimming costume right?). Madakaripura waterfall is a 50-minute car ride from Bromo Tengger Semmeru National Park. It’s just far enough away to get a little nap. If you don’t like sleeping on car journeys though don’t worry, because there is a lot to see out of the window on the journey. 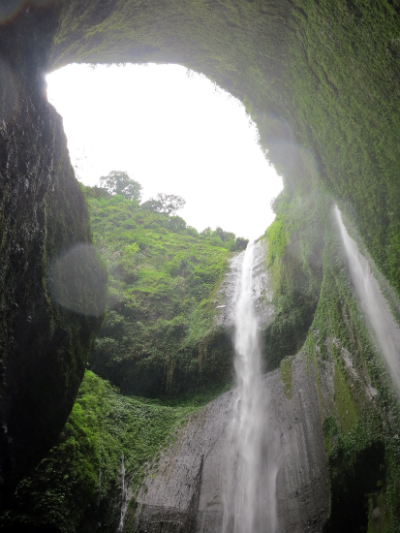 While Bromo is hot and dusty, the area around Madakaripura waterfall is lush, wild and green. It’s a completely different environment and shows the diversity of Indonesia. Madakaripura is located close to the village of Lumbang in Probolinggo. However, although it is located close to the village you’ll never actually visit it. Instead you will be dropped off in a car park close to a small river. You’ll need to follow this river 15-20 minutes upstream to actually get to the waterfall. The journey to Madakaripura is an easy walk along the banks of the river. There’s a concrete path for you to follow, and as long as you never loose sight of the river you can’t get lost. As you go upstream you will need to cross the river several times. The water is not too deep, but it’s a good idea to bring sandals or shoes that you don’t mind getting wet, because you could find yourself slipping into the water. Eventually you will reach a bend in the river and the concrete path ends. The river runs between two steep cliffs in a deep canyon. Water spills over the edge of the cliff creating rainbows, before splashing against the rocks below. Green vines cover the side of the cliff face. It’s incredibly pretty. To reach the waterfall you now need to walk almost in the river, clambering over wet stones. After around 50 meters you suddenly reach the end of the canyon. The water tumbles around the sides of the canyon in sheets of water into a deep cold water pool. This photo doesn’t do it justice. If you brought your swimming stuff you can take a dip in the pool. It’s icy cold as this part of the canyon receives little direct sunlight. Yet the water is incredibly refreshing and cleansing and it’s the best way to get rid of the thin layer of dust you collected from the morning spent exploring Bromo. The Bromo and Madakaripura tour is something really special. It combines the beauty of Bromo with the spectacular waterfall of Madakaripura. You can probably understand why I tell all my friends they have to join this tour if they visit Bromo. It’s a really amazing day trip and if I’m honest I still can’t decide which is better (Bromo or Madikaripura). Luckily I never had to pick as you can visit both sites on the same day. I’ve partnered with a trusted local travel agency to offer you the chance to experience these places for yourself. Interested in joining the Bromo and Madakaripura tour and visiting two of the most interesting tourism sites in East Java? Fill in the form below to email me and make a booking. I respond to every enquiry personally and only work with local drivers and travel agents that I would recommend to my friends. Look forward to hearing from you. Have you visited Bromo or Madikaripura? What did you think? Share your thoughts in the comments below. Huwaaaaa.. harus direncanakan ke sini nih!